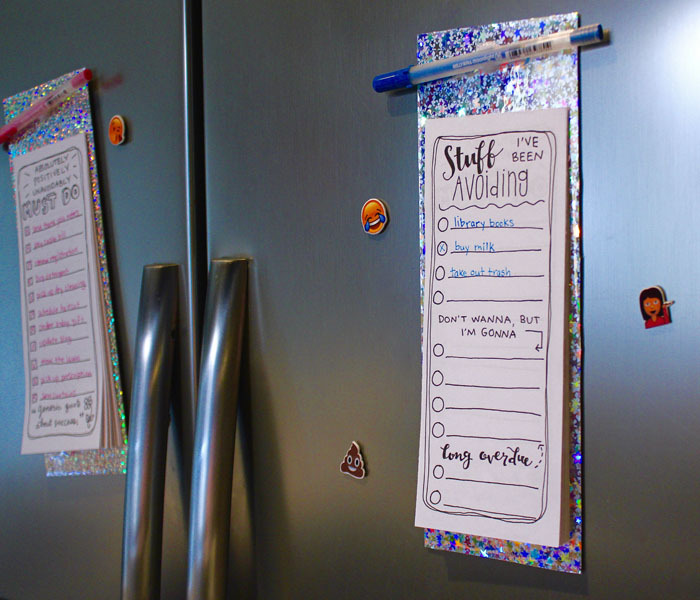 Project Description: Learn how to make your own magnetic notepads! Make a bunch of these at once and give them as gifts. It’s easy to personalize them and create something special. Fold a standard sheet of copy paper in thirds. Then, doodle a different list design in each section. Whenever I’m doodling with pen and paper, my go-to pen is a Pigma® Micron®, made by Sakura. My favorite size is 05, which is bold enough for your drawings to pop, while still being fine enough for writing letters. I’ve included my list layouts in a link in the video description. So you’re welcome to print my design, but it’s a lot of fun to create your own. Duplicate your page. You can scan it and print, or you can copy it. I like to make 8 copies for each paper pad. Cut the paper into thirds. You can either use scissors or a paper cutter. Stack the sheets. I like to vary the order of the pages. Use 3 binder clips on each stack, placing one at top center, and one about ¾ of an inch down each side. Add a thin layer of Mod Podge along the top, and a ½ inch down each side. Allow to dry, then repeat with two more coats. Once those are dry, remove the center clip and add three light coats in that area as well. While you’re waiting between coats, you can make the backing for the notepad. I’m using Grafix chipboard, which is stiff and durable. 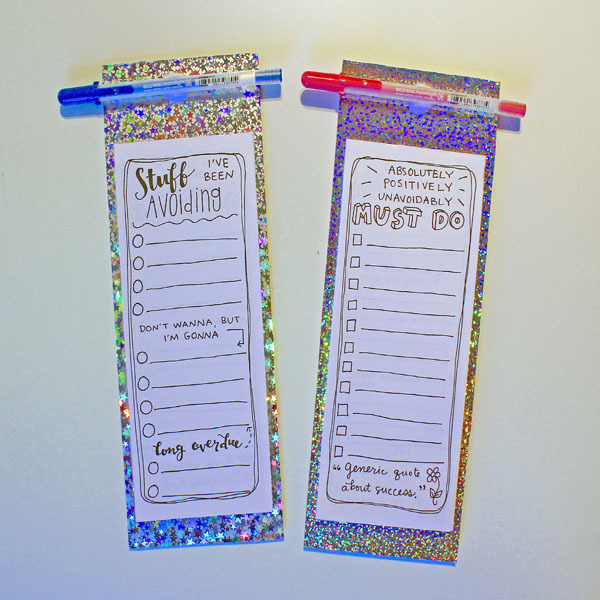 I’m making it pretty with Grafix Funky Film, a sparkly, self-adhesive holographic film. It comes in several varieties and is an easy way to glam up any craft project. Slowly smooth the Funky Film onto the back of the chipboard. The Funky Film is slightly larger than the 8.5 x 11 chipboard, which is nice, because if you don’t get it exactly centered, it will still work out. Trim off the excess Funky Film. Cut the chipboard in half lengthwise to make two backing pieces. Since I can never find a pen when I need it, I want to add one directly to the pad. Add the hook side of a self-adhesive Velcro tab near the top center of the pad. Then add the loop Velcro on top, pressing the pen down to adhere. 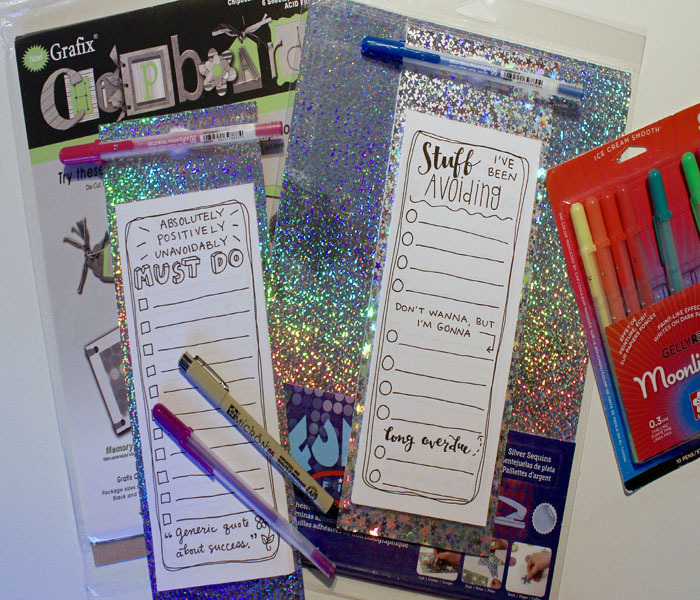 I really like Gelly Roll® Moonlight® pens for list making; they have smooth ink in pretty, playful colors. Finally, add the paper sheets to the backing by adding hot glue near the top of the final sheet. Center on the backing. As you can see, this pad is nice and sturdy, and the pages tear off nicely.